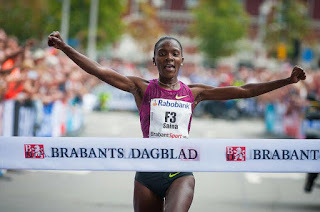 #TILBURGTENMILES :Saina against Flanagan and Teferi on 10k.Bernard Koech on 10miles to run fast..
30.30 is the top time did by Tirunesh Dibaba on 2013 to explain how fast is this course.. and 30.46 defending time did by Betsy Saina last year. Betsy Saina will be back also in 2015 to try an impressive double after a good WCh where she was placed 8th in 10000m.I think Betsy on road could go faster than track so possible to believe she can improve her PB of last year. Against her top contender will be american Shalane Flanagan placed 6th in Beijing and very strong also in road with 2h21.14 on marathon last year in Berlin.She has 68.31 on half and 31.27 on 10k road as PB with a 30.22 on 10k track. Since 25year legendary Lynn Jennings has american record on 10k road with 31.06 and personally possible to think an attack to American Record for Flianagan on this amazing fast course. Ethiopian Senbere Teferi could probably be the surprise of the day after being famous for that amazing final kick against Genzebe Dibaba in 5k track in Beijing and taking a silver medal in front of the big star. She is in top shape after Worlds and with 14.36 as pb on 5k and 4.01 on 1500 could be a dangerous client in last few km...Saina and Flanagan have to push hard before to don t have problems in last part of competition. Genet Yalew from Ethiopia, Jessica Coulson from Great Britain and all dutch athletes willl complete an excellent field. 10miles WR was set in Tilburg by legend Haile with 44.23 in 2005 and Bernard Koech last year with 45.12 did the second ever fastest time on the course. Bernard Koech will be here again this year to try also him an important double but will not be easy as important contenders to battle.Kenneth Kipkemoi will be number 2 but very dangerous with 3times under 60min in halfmarathon in his career. For Dutch supreamacy names will be Abdi Nageeye and Khalid Choukoud with Scott Overall and Matt Hynes to complete roster as Europe.